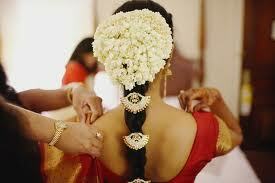 South Indian bridal hairstyles generally follow traditional styles. Brides usually sport long waist-length hair that is thick, black and glossy. Short hairstyles are not favored among South Indian women. So, brides will have to tie their hair in preparation for their wedding. If the bride has short hair, she will usually use hair extensions to lengthen her hair. South Indian bridal hairstyles are not complicated and mostly, hair is braided. Generally, a single long braid will run down the bride’s back. Sometimes the bride uses hair extensions even with waist length hair. This is done to achieve exceptionally thick and long hair. Occasionally, some South Indian brides will have two braids. In styling hair for South Indian bridal hairstyles featuring a braid, the hair is first pulled back from the face and parted in the middle. A braid is fashioned starting from the middle of the back of the head. Tassels are attached to the end of the braid. Jasmine flowers and roses are then inter-twined in the hair. Faux jewelry is then clipped on the top of the head and in the middle from where hair is parted. The end result is hair that is very heavy and thick to carry but gorgeous to look at. This hairstyle is developed only for the wedding day and is not for casual wear. The bun hairstyle has begun to gain favor among South Indian brides. Buns are easier to tie than a braid and do not required lengthy hair extensions. The bun is tied either at the nape of the neck or the side of the neck under the ear. The Spanish up-do hairstyle is favored by upper middle class brides who sweep up their long hair and fashion large curls on their crown. Trendy and chic weddings will see the bride having a more Bohemian hairstyle where her long hair is let loose with waves and curls. Traditional South Indian bridal hairstyles feature a long braid filled with flowers, leaving the hair smelling exceptionally fragrant. Fashionable hairstyles have gradually upstaged the traditional look and South Indian brides are now more willing to experiment with trendy styles.